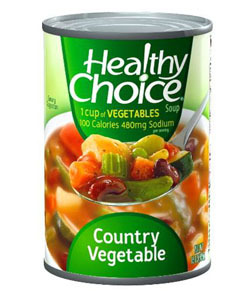 I really love Healthy Choice products because they are very low in sodium. I ordered the Healthy Choice Chicken Noodle Soup from Amazon.com several months ago, because I have not been able to find the "can" soup in stores. The grocery stores only have the microwavable bowls which makes the soup taste like plastic. Therefore, I was happy to see that I could order the can soup from Amazon.com. My first order of the Healthy Choice Chicken Noodle "can" Soup was great. I enjoyed every can. However, my second order of the Healthy Choice Chicken Noodle Soup was very disappointing. Out of the 12 cans, there were 7 cans that were severly dented. I knew that there was something wrong before I opended the Amazon package/box, becaused the box was soiled. Some of the dents were so deep that it resulted in seepage. There were too many leaks, dents, and the box was so damaged that I could not return the product even if I tried. This was a waste and loss of money. Because of the location of the dents on the cans, I truly believe that they were packaged that way. My order was "packed" with dented cans. The dents were not the result of shipping or handling. I will never order this product again unless Amazon.com can ensure that my order will not be packaged with dented cans. The Healthy Choice Chicken & Dumplings Soup was very tasty and more hearty than I expected. There is more broth in this product than in Healthy Choice's beef soup and chicken and rice, but still satisfying. **Do be careful if you are on a low-sodium diet, as it is difficult to dillute this product to reduce the sodium any further. But it still has far less sodium than in regular soups. TIP: Healthy Choice Soups are good for enhancing larger pots of soup when added to your own fresh ingredients. A meal stretcher in the winter months. Several of the cans were dented upon arrival. When I ordered soup from Walgreen's, their cans were tightly wrapped in bubble-wrap and had no dents. 5.0 颗星，最多 5 颗星Love the taste, bit pricey. I hate that Healthy Choice hasn't been in stores any more. This is my favorite one, and I hate the microwave cups, those things are terrible. Glad I could find it, the price isn't great, but when you want something you go for it. We received 12 cans. Four cans were dented beyond belief. One was actually smashed. 4 cans were barely acceptable even though they were dented. The other 4 were okay. I considered returning the cans to Amazon but what would they do with them and repackaging would be a lot of trouble so I donated the dented cans to a food bank. Amazon offers a microwaveable bowl in a 14 oz. size. We've ordered that before and it was much better. I wil never order soup in the can from Amazon again. good soup for those who are concerned about all the fat content that chicken skin created for the broth contains..has a minimal fat content..but that does affect the flavor..so if the flavor doesn't bother you..then this soup is for you..the flavor is more mild and not heavy..it's good..but not the best I have ever tasted!..overall..it's good..